The superbloom broke bad, and fast. 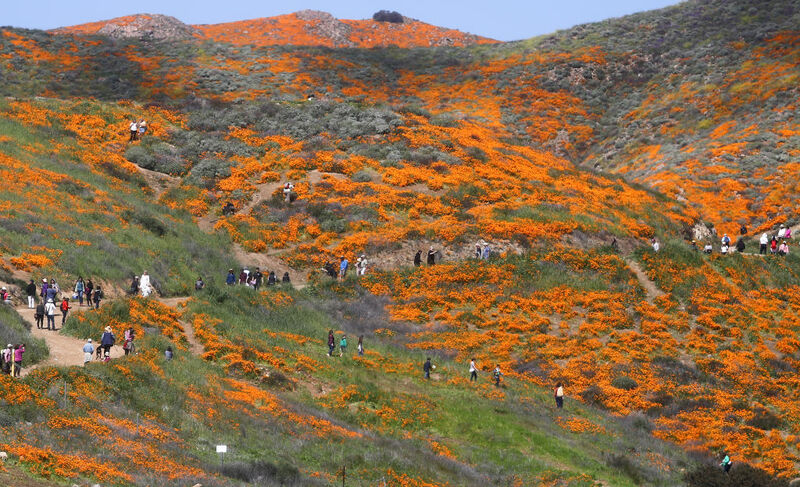 Just a couple weeks into the bloom season, Lake Elsinore city officials closed off the Walker Canyon poppy fields to the public, reopening them in a limited capacity on Monday. The restrictions were put into place after reports of heavy traffic, widespread destruction of the ecosystem, and injuries including a city employee becoming the victim of a hit-and-run motorist. After a rainy winter, the conditions were primed for a spectacular superbloom of native wildflowers, bursting forth from the ground. What Lake Elsinore was not prepared for was the even more powerful burst of human beings, tired of being cooped up at home, eager to embrace the vibrant first signs of spring. Hordes of visitors were swarming the bloom area each weekend, with some arriving before dawn. The town of just 66,000 residents was seeing an estimated 50,000 to 100,000 visitors in a single day, just to catch a glimpse of the poppies. City staff and local volunteers attempted to control traffic and conduct (misdeeds included illegal parking jobs, pulling out of plants, and even reported public urination). They even went so far as to establish a shuttle service allowing visitors to park at a nearby shopping mall and be bussed over to the bloom. “We have reached out to our neighboring and county agencies for help. We have reached out to Caltrans. We have reached out to CHP. We are running out of options,” a desperate city Instagram post said over the weekend, announcing some initial street closures before deciding to pull the plug entirely. Part of the issue is how Walker Canyon Ecological Reserve is structured. Unlike some state or national parks which have specific entrance and exit points, the reserve is free to the public and has no designated entry points. In the case of the superbloom, that means poppies blossom nearly to the edge of the freeway. And that, in turn, encouraged looky-loos to just stop wherever they spotted orange. The solution for some who want to experience this season’s wildflowers may be to visit other viewing locations. The bloom is just now starting at the Antelope Valley Poppy Reserve, and a bloom is underway at Anza-Borrego State Park. Visitors hoping to check out either should consider if there are off-peak times when they might be able to visit to have the best experience, and are reminded to obey all local traffic directions and stick only to designated trails upon arrival. Next articleWhat Happened to Simone?